We will hold a photo exhibition “Blue Duffy (1933-2010)” DUFFY … PHOTOGRAPHER “(Duffy Photographer). Duffy is a British fashion photographer active in the 60s and 70s. Along with David Bailey and Terence Donovan he was a great image maker of Swinging London in the 1960s and was a star photographer famous as well as a model. They refused to portrait at the mainstream studio and were innovators who changed the industry standards significantly with documentary fashion photography. They were the pioneers of common street, fashion and photography now. The Sunday Times at the time seemed to call them “Terrible Trio” and famous photographer Norman Parkinson called “The Black Trinity (ominous trio)”. Duffy’s career starts with the work of The Sunday Times. After that, he worked at British Vogue magazine from 1957 to 1963 and photographed Jean Shrimpton and others. In the 1960s he was active in magazines and newspapers other than Britain such as French El magazines. He is a member of this era, Sydney Poitier, Michael Caine, Tom Courtney, Sammy Davies Jr., Nina Simone, John Lennon, Paul McCartney, Charleston Heston, William Burrows, Brigid Bardot Shooting celebrities such as. After the 1970’s, Jacket photographs of David Bowie’s 1974 album “Aladdin Sane”, Benson & Hedges, Admin campaign of Sminoov, twice in the Pirelli calendar (1967, 1973) It is known for his work. In the summer of 2013, David Bowie’s retrospective exhibition “David Bowie is” held at the Victory & Albert Museum in London, the main visual showed that the bowie of “Aladdin Sain” opened its eyes and the other cut was used and Duffy Popularity has rekindled. In 1979 Duffy stopped the photo and burned a lot of negatives in the studio backyard. However, since 2006, Mr. Chris, son, started Duffy’s review of the material. Luckily it turns out that not all negatives disappeared. 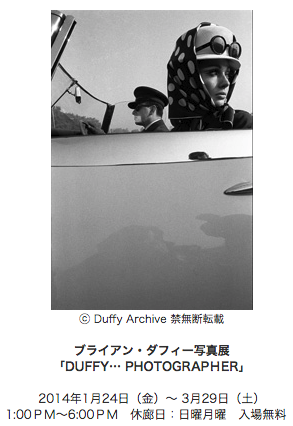 By rediscovering a lot of new negatives, photo collection of Duffy works was realized in 2011. After that, as Bailey who was active in the 1960s, Donovan became the second man behind again as a third man, and many photo exhibitions are held all over the world. The first exhibition in Japan will display about 30 best works from the series of fashion, portrait, David Bowie. Both works are a work group that can enjoy the mood and atmosphere of the 60’s to 70’s. The exhibition is an estate · print work provided from Duffy Archives operated by Mr. Chris who inherited the author’s intention.